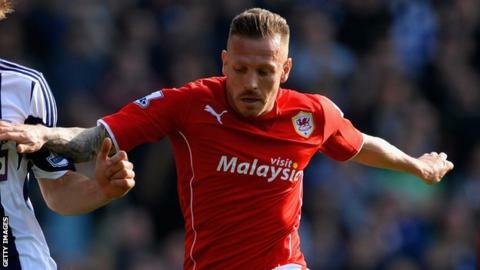 Cardiff City manager Ole Gunnar Solskjaer has stressed the importance of Craig Bellamy to the Bluebirds' bid for Premier League survival. The Norwegian says Bellamy, who has been out with a virus, will play against Sunderland on Sunday at the Stadium of Light. Cardiff are two points from possible safety in 18th, one point ahead of the Black Cats who are bottom of the table. "Craig's massively important for us in and around the place," said Solskjaer. "He's fit. He's done really well this week in training. He's looked sharp and he's ready to go." Bellamy hasn't started a match since March when the Bluebirds drew 3-3 draw at West Brom. Solskjaer says he is hoping to draw on the experience of the former Wales and Liverpool forward for Sunday's crunch clash at relegation rivals Sunderland. "It's being built up and it is a massive game," said Solskjaer. "Craig will probably be involved. Let's see whether it's from the start or coming on as a sub." Solskjaer says victory is vital to both side's chances of staying up. "It's a chance I think to get the points that both of us need to give ourselves a chance in the last two games," he said. "It's still so tight down at the bottom that a win will be hugely needed for both of us, a draw's probably no good for anyone." Sunderland should be brimming with confidence after earning four points from their last two matches against two sides fighting with Liverpool for the Premier League title. Gus Poyet's side followed up a 2-2 draw at Manchester City with a 2-1 win at Chelsea. Cardiff have also gained four points from their last two matches, winning 1-0 at Southampton and drawing 1-1 at home against Stoke City. Solskjaer says his side are also full of confidence going into the crucial clash. "With the return of players like Peter Whittingham, we've got some fresh legs, fresh minds and I think the last two games definitely have given us a boost," said Solskjaer. "We are going into this game in good form and that's a big thing. "We are away from home but we went away to Southampton and beat them...and we'll go there with the belief that we can get something." "It's about us going up there, performing, sticking together, like we did against Southampton and as we did against Stoke, apart from the last 10 minutes."